The stars were watching. A myriad of nameless points of light illuminated my cabin, silent witnesses to countless mysteries, including the one standing before me. Like all Emkharnae, Rohrja Ikameaseh was murcuriel at best, volcanic at her worst, yet more than competant at her profession. She was holding her report with all the delicacy a Green Priestess would give to a sapling. I let her wait a moment more as I finished the final touches of the duty roster. Her Emkharnen upbringing kept her from fidgeting, though she was excited enough to sparkle cobalt along her pelt at any sound. Rohrja's ruby eyes were hidden under blue-fringed black of her hair, her downturned head showing only the small muzzle and wide pink ears from among the ebon mane. I pushed the roster aside and folded my arms. Lightly, I cast her name. The little ermine did not jump so much as bloom at my attention. "Honored captain, I have verified the sensor's readings on system KCS2413-8116-0031. Your attention is requested regarding this." She laid the crystal pad on my desk with a bow, a gift for the teacher. I palmed the screen and read while she stood by. Its importance was noted by her continued attention and discretely open mental ears, unwilling to scan but aching for information. Not even the characteristic twitch of my left ear gave away anything but the air of the jaded star-hopping captain that I portray. Anomalous readings from life-zone planets are nothing new. 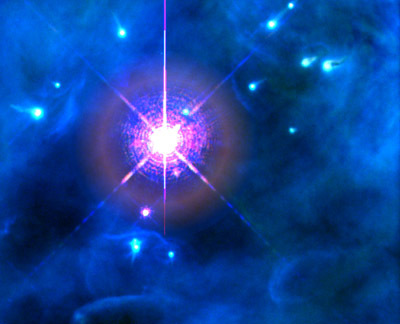 Energy outburst from stars, erratic or regular, are nothing new. Emission nebulae surrounding young stars are certainly nothing new. "All right, Rohrja, what's the problem?" I finally asked. The little ermine pointed out some numbers before speaking. "Honored captain, sensor readings show this system to be under one billion eharae old, a typically young star just past T Tauri stage with remnants of the birth cloud still dissipating. Any planets this system has should still be in primary development. Planet 2 shows significant vegetation and possible animate life!" The numbers were there, and Rohrja is proud of her accuracy. The jaded old Kerv'Dirlen captain continues to stare at the numbers. The civet cat artist inside me takes over and builds mental pictures from the stark formulae. Something chimes in my mind and I cannot help but hum the poem fragment aloud. Fair Ashandra dreams as the dancing stars all sing. "You know that is just a lover's ballad," Rohrja was unusually terse, " and nothing but allegory and poetic fantasy." Her pelt flushed burnt brick as her indignant anger surfaced. A questing brush of her thoughts tells me that she wishes nothing to mar her triumph of finding a habitable, though anomalous, planet: certainly not a mocking captain. "I know that ballads and poems similar to Chelse's Dream have been around for millennia. Mishtannae may or may not exist, who's to say? But I think it is quite interesting coincidence that an older or terraformed planet orbits a young star in this particular sector, surrounded by a nebula that is creating chromatic diffraction and suffusing the local space in a blue light? It does fit the poem, you know, if Ashandra is the Mishtannae homeworld as the bards say." "There are NO khromat mice!" Rohrja left in an orange blur. Curiouser and curiouser. I debate patching her room sensors to my desk. I continued to ponder the matter as I read over the solar variances data. The artist giggles a thought and calls up an ancient program I wrote in the academy as I half-dreamed being a buccaneer while studying astrogation. A generator of chaotic-seeming microtonal music my kindred liked. I plugged the variance numbers through the conversion filter and patched a standard sound generator to the output, adjusting certain instrumental sounds to certain ranges. It was strange and familiar and completely unexpected. Amidst the fretted tamjan and hammered duluce strings and the chaotic melding of basso came a haunting woodwind trill into a melody. It was Chelse's Dream. I patched in an old voice version I kept in my personal files. Only minor adjustments were needed to sync the voice to the music. As I listened to this weirdly uplifting version of an ancient ballad, I felt someone's attention on me. I turned in the direction the feeling was strongest and looked.